After the fall of the Soviet Union, there has been a crisis of the socialist imagination. In this period of crisis, we talk about the limitations of the Soviet experiment and later of the Chinese experiment. We are critical – depending on our political stream – on how they deviate from the socialist path. These ‘deviations’ have been described as social imperialism, bureaucratic capitalism, state capitalism, or bureaucratic socialism. But these critics of the socialist experiments have not offered, concrete ideas on what could have been done instead in that phase of socialism. Keeping in mind the context of 20th century socialism and its limitations, that the command economy was the consequence of a production technology that privileged economies of scale and therefore, vertical and horizontal integration. When we come to the 21st century, we have to build our new emancipatory model of 21st century socialism. For this to happen, we have to envision the socialist system of production in the 21st century. Without such an emancipatory model of socialism, we would limit our imagination in the fight against capitalism. No system falls because of all the problems of such a system. Even in physics or natural sciences, no theory gets overthrown by its contradictions; it gets overthrown only when a new theory addresses those contradictions and resolves them. Similarly, we have to construct a vision of the socialist system – that can, as a system of production, express itself in different ways, even within the womb of the neoliberal capitalism. And this vision must be effectively communicated to the people. To build such a vision, we need to probe the nascent forms of socialist production. This calls for a critical examination of what capitalism is doing to production. If capitalism can de-skill technology, break up and fragment the work place, is it possible for us to bring intellect workers, say those who produce designs for Apple, together with the manual workers who manufacture Apple products? Can we get that knowledge that exists with intellect workers; and combine it with the existing small-scale production – who produce a whole lot of goods in either a petty commodity production mode, or as ancillaries to the major brand names? Can we get them together to build a different system of production within the existing structure? Can we weaken capitalism’s control over knowledge and over brands? Can we start fighting all these today – and not wait till we seize state power? Our earlier slogan was "Think global, fight local". This is not enough today. We have to think global, but we also have to fight globally. We cannot fight the capitalist system at one place; that place can be abandoned by the capitalist for another. Capital has become, in some sense, footloose, because it owns the intellectual property, the designs, the software, the distribution system, the brand name. It does not care where its products are manufactured. Apple can abandon Foxconn and go to somebody else, located in a completely different place, with very little loss. Foxconn, merely manufactures the Apple products. Not surprisingly, of the iPhone price 1, Apple’s profits are 58.5 per cent, Foxconn’s 14.3 per cent profit, while the workers are paid, as wages, only 1.8 per cent of the iPhone price. Apple can offer high wages to a small number of intellect workers who produce the designs and the software, while the bulk of the workers producing the actual phone are paid a pittance. Can the Left fight Apple not simply by organizing workers but building smartphones through producers’ cooperatives that bring together intellect workers and the workers who make the phones? With free software movements and peer-to-peer production movements, this is possible today. Can the Left and the local governments that may be under its sway, lead such efforts? This is not to argue that the workers’ cooperatives will gradually replace capitalism without the need of seizing state power. My argument here is that we need to think about how to combine our socialist vision of the future – the kind of production system, the kind of distribution, the kind of ownership – and begin demonstrating parts of these here and now2. We can then provide a platform for local Left governments, give them certain tasks of building and demonstrating proto-socialist alternatives, even within the existing constraints. Otherwise, Left governments have the danger of becoming merely better caretakers of the capitalist system than the capitalist parties themselves. We may not have all the answers, but we need to start thinking on how we can built an alternative system of production, and start, experimenting on it today. Repeated capitalist crisis is integral to capitalism: it will continue to be there as long as capitalism exists. As long as capitalism is not overthrown, it will always get over its crisis by expanding in different ways, finding new commodities; at the current moment, it finds personal data as the new commodity; it expands continuously into new dimensions, through dispossessions, through enclosure of the commons, and so on. Unless we have an alternative system in place, at least in our imagination, capitalism cannot be overthrown. Our task is to see how to overthrow capitalism, but that cannot be done unless we combine it with an emancipatory vision of our socialism and our socialist imagination. This is how we should remember the October Revolution, not through empty homage but by rebuilding our revolutionary vision. 1. Christian Fuchs, "Digital Labor and Imperialism", Monthly Review, January 2016. 2. For a study of an important socialist cooperative, see T. M. Thomas Isaac and Michelle Winters, Constructing Alternatives: The Story of a Workers’ Society in Kerala, New Delhi: LeftWord Books, forthcoming. Read our first feature from the series #OctoberRevolution Month here. Prabir Purkayastha is the chief editor of Newsclick. 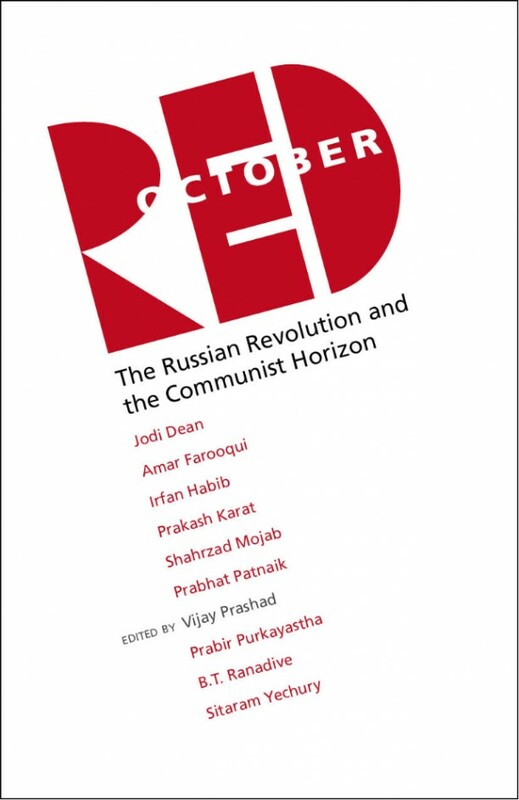 This is an excerpt from Red October: The Russian Revolution and the Communist Horizon, edited by Vijay Prashad, New Delhi: LeftWord Books, 2017.